More and more, savvy iPhone and Android users are “checking in” to places they visit. This is a good trend for local businesses and you should encourage it. Smart phone apps like Facebook, Foursquare and Yelp allow users to check-in to locations to share places with their friends. When they do, it’s like they just sent an advertisement for your business to all of their friends. Each check-in sends a powerful signal to the search engines. Google, Bing and Yahoo can see that this company is a trusted local business. It’s a great way to help improve your local search rankings. The customer shows the front desk their smartphone with the check-in on the screen and receives the discount. Facebook then displays “Suzi Q checked into California Gold Gymnastics.” That’s a recommendation. It’s the best kind of personal advertising – word of mouth. We suggest you do the same thing at your business and offer a discount or gift for checking in on a smart phone. 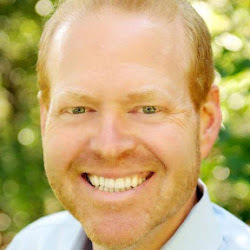 “The ability to interact with consumers on this micro-local level through special offers, deals and other incentives provides brands with the real-time opportunity to engage consumers through their mobile device,” says Mark Donovan, ComScore‘s senior vice president of mobile. The Los Angeles Times reports that 1 in 5 smart-phone owners use check-in apps, with Facebook being the most popular. According to a new study by the Pew Internet & American Life Project, the popularity of check-in apps continues to grow. 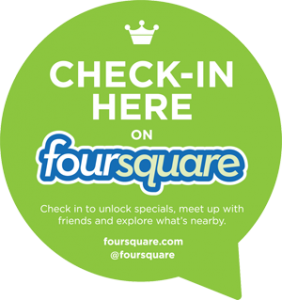 Pew’s survey found that in February 2012, 18% of U.S. smartphone owners over 18 used geosocial check-in apps like Foursquare. That’s up from 12% in May 2011. Expect that number to rise to over 25% of smartphone users in 2013. 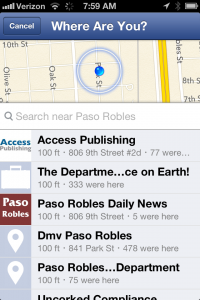 In 2010 Facebook rolled out a long-awaited location feature called Facebook Places to compete with Foursquare. It’s an application that lets users “check in” on their mobile phones so friends know where they’re hanging out and what they’re doing. It’s a function similar to what competing apps have been doing for a while. But Facebook’s 500 million-user base dwarfs the 2 million-plus on Foursquare, meaning the “check-in” concept is probably new to a lot of folks. Yelp check-ins provide an entirely new way for your customers to exclaim their love for your business: by literally walking through your door and telling their friends they’ve arrived at your place of business. Because Yelp’s Android and iPhone apps synchronize with Twitter and Facebook, your business’s buzz can travel far and wide. Your customers have been using Yelp to “check in” to your place of business ever since it was launched in 2009. 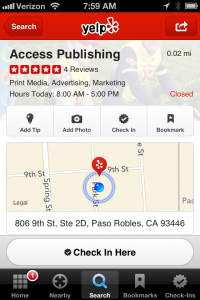 Yelp allows local business to create check-in offers. Foursquare is an Internet directory and smart phone app that helps users connect with their friends by sharing their locations. Foursquare is popular for checking-in to places users visit like restaurants, attractions, retails stores and office. The free service has over 30 million user worldwide who have made over three billion check-ins, with millions more every day. Google Latitude is a location-aware mobile app developed by Google as a successor to its earlier SMS-based service Dodgeball. Latitude allows a mobile phone user to allow certain people to view their current location. Via their own Google Account, the user’s cell phone location is mapped on Google Maps. The user can control the accuracy and details of what each of the other users can see — an exact location can be allowed, or it can be limited to identifying the city only.